Maria really doesn't like caves so it took some arm twisting to get her to visit. Eventually I convinced her that a few days at the wonderful Raffaello Residence (click here for more) would do her the world of good. Even if we didn't go into the caves the countryside around here is so beautiful that it is worth coming just for that. It didn't take much convincing and we were off. I'd first visited over twenty years ago and the sight of the church inside the caves is something I'll never forget. To say it is amazing, incredible or any other adjective is a complete understatement. The best thing is to look at the great photo by Jim DeLutes on the top of this page to get an idea. Actually all the photos on the page are by Jim. First of all if you're wondering where the caves are there's a map at the bottom of the page. 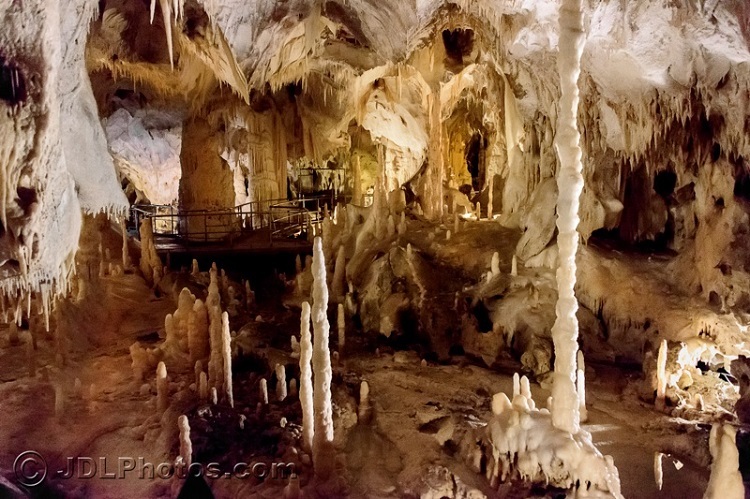 These are probably the best caves in Italy and I've never seen so many stalactites and stalagmites in a cave. Maria too, once I'd convinced her it was worth entering, was left speechless and that rarely happens. This is the church in a cavern I mentioned; to get here you'll need to follow a winding little path up from the cave. It is about a mile (two kilometers) but the climb can sometimes be a little steep. Once you get here you'll forget your aching muscles thouigh and realise just how worthwhile it was. The Madonna di Frasassi is a simple little place with the walls built against the side of the cliff. 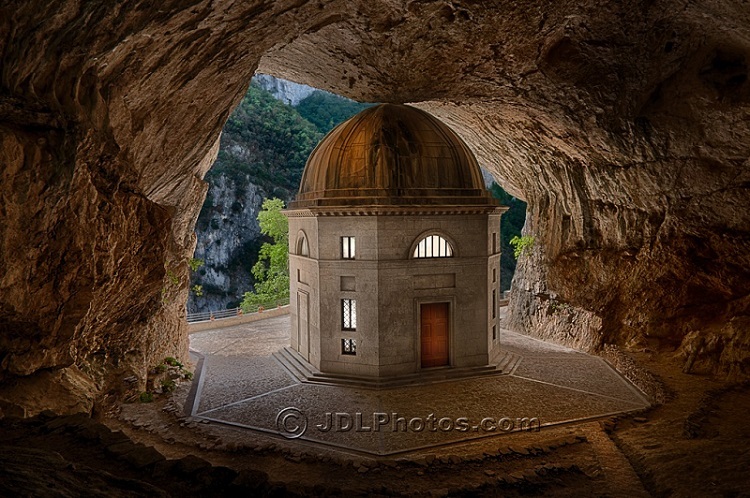 The Temple of Valadier though is what really amazes, built right inside a huge cavern. It has a famous marble altar piece of the Virgin Mary and Child by Antonio Canova and the temple was build on the instructions of Pope Leo XII by the great architect Giuseppe Valadier but the location is what will astound you the most...incredible! 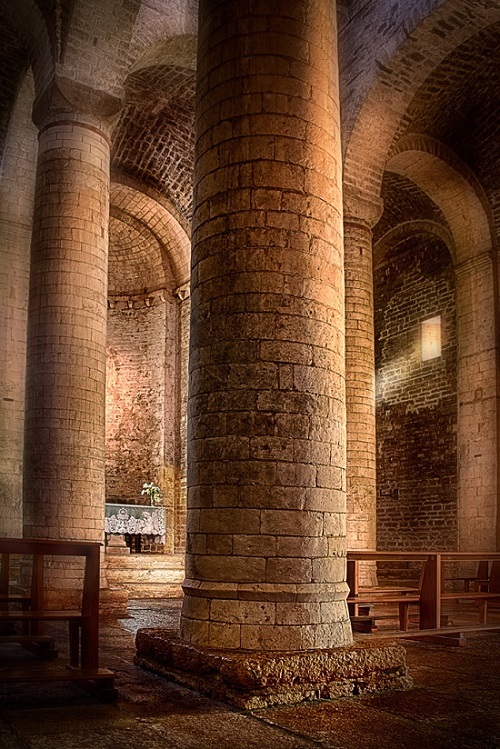 If you are visiting the caves don't miss the very special Abbazia, a Romanesque style church built in the 11th century. Ringed by mountains and breathtakingly beautiful. You walk in expecting...I don't know really... but the huge columns stretching skywards and the white and rose stone bathed in a golden light was way beyond my expectations. The photo below shows what I mean. The Abbazia is just a short distance before the caves, you pass by it as you head there if you are coming from Genga. If you miss it or are coming the other way don't worry, everyone at the caves will be happy to give you directions. 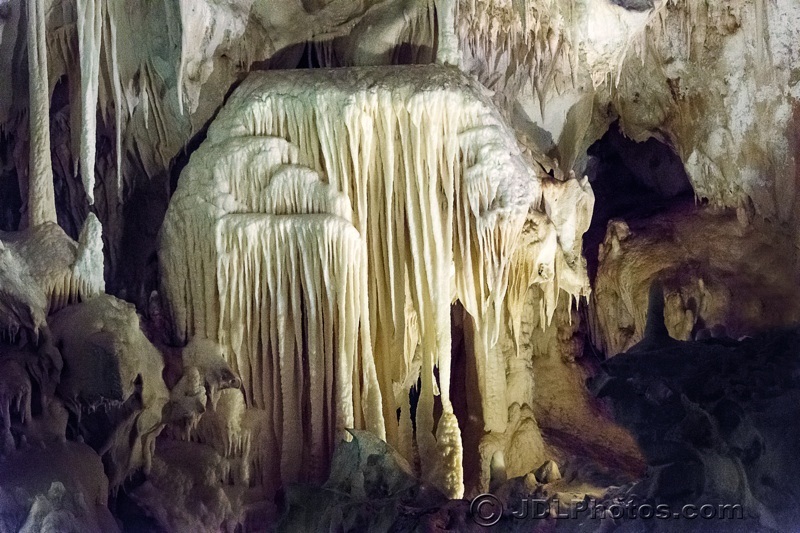 Where are the Frasassi Caves?